Volkmann contracture (see the image below) is a permanent shortening of forearm muscles, usually resulting from injury, that gives rise to a clawlike deformity of the hand, fingers, and wrist. It is more common in children. Radiographs of the humerus, elbow, and forearm are useful for assessing the amount of displacement of supracondylar fractures and combined radial and ulnar fractures. Nondisplaced supracondylar fractures rarely cause Volkmann contracture. Initial treatment for Volkmann contracture consists of removal of occlusive dressings or splitting or removal of casts. Analgesics provide symptomatic relief in chronic cases. Both physical therapy and occupational therapy are vital to the improvement of range of motion and the return of function in patients with Volkmann contracture. Volkmann contracture (or Volkmann ischemic contracture) is a permanent shortening (contracture) of forearm muscles, usually resulting from injury, that gives rise to a clawlike deformity of the hand, fingers, and wrist. It is more common in children. A similar condition can occur in the foot. In 1881, Richard von Volkmann attempted to ascribe irreversible contractures of the flexor muscles of the hand to ischemic processes in the forearm, in the belief that the problem was caused by massive venous stasis and simultaneous arterial insufficiency secondary to overly tight bandages. In 1906, Hildebrand first used the term Volkmann ischemic contracture to describe the final result of any untreated compartment syndrome; he was also the first to suggest that elevated tissue pressure may be causally related to ischemic contracture. In 1909, Thomas reviewed the 112 published cases of Volkmann contracture and found fractures to be the predominant cause. He also noted, however, that tight bandages, an arterial embolus, or arterial insufficiency could also lead to the problem. Since then, much has been learned about the etiologies of Volkmann contracture and, more important, about its preventive therapies. In 1914, Murphy was the first to suggest that fasciotomy might prevent Volkmann contracture. He also suggested that tissue pressure and fasciotomy were related to the development of contracture. During World War II and subsequently, many cases of Volkmann contracture occurred as a result of high-velocity gunshot wounds that caused fractures. Unfortunately, the arterial spasm accompanying the fracture was seen as the cause; therefore, more attention was directed to treating arterial spasm than to determining the need for fasciotomy. Surgical exploration of the artery often led to reversal of an acute impending compartment syndrome—probably, it is now believed, because vascular surgeons were actually performing limited fasciotomies while they were exposing the vasculature. Appreciation of the importance of fasciotomy grew during the Vietnam War, and in 1967, Chandler and Knapp suggested that long-term results might have improved if the surgeons had included routine fasciotomy with arterial repairs. Originally, most studies of ischemic contractures were focused on those of the upper extremity. In 1958, Ellis reported a 2% incidence of compartment syndrome with tibia fractures, and increased attention was paid to contractures involving the lower extremities. Initially, the focus was on the anterior compartment of the leg, but the work of Seddon, Kelly, and Whitesides in the mid-1960s demonstrated the existence of four compartments in the leg and the need to decompress more than just the anterior compartment. [1, 2] Since then, compartment syndrome has been shown to affect many areas of the body, including the hands, feet, thighs, and buttocks. Current research is aimed at reperfusion of the ischemic extremity. Some advocate the use of hyperbaric oxygen to improve tissue oxygenation and prevent further myonecrosis. Early detection and prevention are still important in preventing severe disability. Frequent repeat examinations are required. Miniature transducer-tip catheters may allow continuous and accurate measurements of intracompartmental pressures. Other noninvasive techniques for Volkmann contracture are currently under investigation. A routine check of the passive range of motion of all fingers immediately after closed reduction of radial or ulnar fractures is recommended. If muscle tethering is detected, repeat manipulation of the fracture is required to release the muscle. If this is unsuccessful, surgical release through a small incision should be attempted to normalize the length, excursion, and function of the FDP. Function can be restored by untethering the muscle and its tendons from the ulnar fracture via early manipulation or late localized myotenolysis. Any process that leads to increased compartmental pressure can lead to a compartment syndrome. For example, a decrease in the compartment size with no change in the volume of the content results in increased pressure. This change can be secondary to closure of fascial defects, localized external pressure, or overly tight dressings. Increased capillary permeability can be due to exercise, burns, hypoalbuminemia, intra-arterial drugs, surgery, seizures and eclampsia, exercise, or trauma (without major vascular injury). Exercise, venous obstruction, and use of a long leg brace can lead to increased capillary pressure. Muscle hypertrophy or neoplastic processes can increase the volume of the compartment’s content and thus the intracompartmental pressure. Finally, infiltrated infusions are an iatrogenic cause of this state. Overall, Volkmann contractures are rare, with an incidence of about 0.5%. In a review of 978 consecutive upper-extremity long-bone fractures in children admitted to the hospital over a 13-year period,  33 patients had a supracondylar fracture, and three of these developed a compartment syndrome necessitating fasciotomy. In a subgroup analysis, nine children had ipsilateral displaced extension supracondylar humerus fractures or displaced forearm fractures. In this subgroup, the prevalence of Volkmann contracture was 33%. Cubitus varus, or gunstock deformity, is the most common complication in Volkmann contracture. This results in the loss of the carrying angle of the upper extremity. Cubitus varus has been reported in as many as 25-60% of patients. The rate depends on the management approach. With the use of percutaneous pinning, the incidence of this complication has decreased to less than 10%. With valgus or varus deformities in the coronal plane, remodeling is unlikely, if it is possible at all. Nerve injuries occur in 7% of cases, with common involvement of the radial, median, and ulnar nerves. Most deficits are seen at the time of injury. Fortunately, neurapraxias resolve with conservative management. Motor function returns at 7-12 weeks, followed by the recovery of sensation, which may take more than 6 months. In a small study (N = 12) of patients with established Volkmann contracture, Meena et al assessed the results of median and ulnar nerve neurolysis in terms of reducing nerve palsy and hand muscle paralysis. They found that this procedure improved the outcome for motor and sensory components of median and ulnar nerves and noted that this improvement was not significantly affected by whether the neurolysis was performed early (≤ 6 months) or late (>6 months) after onset of Volkmann contracture (contrary to what might have been assumed). Reportedly, 10% of children with supracondylar fractures temporarily lose the radial pulse. Fortunately, this loss is most often due to swelling and not to direct brachial artery injury. Reducing the fracture usually helps to return the arterial flow. Oprel PP, Eversdijk MG, Vlot J, Tuinebreijer WE, den Hartog D. The acute compartment syndrome of the lower leg: a difficult diagnosis?. Open Orthop J. 2010 Feb 17. 4:115-9. [Medline]. [Full Text]. Shuler MS, Reisman WM, Kinsey TL, Whitesides TE Jr, Hammerberg EM, Davila MG, et al. Correlation between muscle oxygenation and compartment pressures in acute compartment syndrome of the leg. J Bone Joint Surg Am. 2010 Apr. 92(4):863-70. [Medline]. Myers RA. Hyperbaric oxygen therapy for trauma: crush injury, compartment syndrome, and other acute traumatic peripheral ischemias. Int Anesthesiol Clin. 2000 Winter. 38(1):139-51. [Medline]. Hargens AR, Mubarak SJ. Current concepts in the pathophysiology, evaluation, and diagnosis of compartment syndrome. Hand Clin. 1998 Aug. 14(3):371-83. [Medline]. Harris IE. Supracondylar fractures of the humerus in children. Orthopedics. 1992 Jul. 15(7):811-7. [Medline]. O'Hara LJ, Barlow JW, Clarke NM. 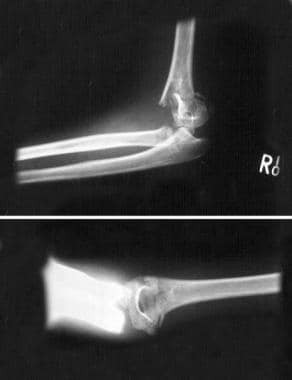 Displaced supracondylar fractures of the humerus in children. Audit changes practice. J Bone Joint Surg Br. 2000 Mar. 82(2):204-10. [Medline]. Ragland R 3rd, Moukoko D, Ezaki M, Carter PR, Mills J. Forearm compartment syndrome in the newborn: report of 24 cases. J Hand Surg Am. 2005 Sep. 30 (5):997-1003. [Medline]. Flynn JM, Jones KJ, Garner MR, Goebel J. Eleven years experience in the operative management of pediatric forearm fractures. J Pediatr Orthop. 2010 Jun. 30(4):313-9. [Medline]. Erdös J, Dlaska C, Szatmary P, Humenberger M, Vécsei V, Hajdu S. Acute compartment syndrome in children: a case series in 24 patients and review of the literature. Int Orthop. 2011 Apr. 35 (4):569-75. [Medline]. Geissler J, Westberg J, Stevanovic M. Pseudo-Volkmann Contracture: A Case Report and Review of the Current Literature. J Am Acad Orthop Surg Glob Res Rev. 2018 Nov. 2 (11):e031. [Medline]. [Full Text]. Deeney VF, Kaye JJ, Geary SP. Pseudo-Volkmann's contracture due to tethering of flexor digitorum profundus to fractures of the ulna in children. J Pediatr Orthop. 1998 Jul-Aug. 18(4):437-40. [Medline]. McDonald S, Bearcroft P. Compartment syndromes. Semin Musculoskelet Radiol. 2010 Jun. 14(2):236-44. [Medline]. Prayson MJ, Chen JL, Hampers D, Vogt M, Fenwick J, Meredick R. Baseline compartment pressure measurements in isolated lower extremity fractures without clinical compartment syndrome. J Trauma. 2006 May. 60(5):1037-40. [Medline]. Blakemore LC, Cooperman DR, Thompson GH, Wathey C, Ballock RT. Compartment syndrome in ipsilateral humerus and forearm fractures in children. Clin Orthop Relat Res. 2000 Jul. (376):32-8. [Medline]. McGraw JJ, Akbarnia BA, Hanel DP. Neurological complications resulting from supracondylar fractures of the humerus in children. J Pediatr Orthop. 1986 Nov-Dec. 6(6):647-50. [Medline]. Meena DK, Thalanki S, Patni P, Meena RK, Bairawa D, Bhatia C. Results of neurolysis in established upper limb Volkmann's ischemic contracture. Indian J Orthop. 2016 Nov-Dec. 50 (6):602-609. [Medline]. [Full Text]. Garner AJ, Handa A. Screening tools in the diagnosis of acute compartment syndrome. Angiology. 2010 Jul. 61 (5):475-81. [Medline]. Collinge C, Kuper M. Comparison of three methods for measuring intracompartmental pressure in injured limbs of trauma patients. J Orthop Trauma. 2010 Jun. 24(6):364-8. [Medline]. Domanasiewicz A, Jablecki J, Kocieba R, Syrko M. Modified Colzi method in the management of established Volkmann contracture--the experience of Trzebnica Limb Replantation Center (preliminary report). Ortop Traumatol Rehabil. 2008 Jan-Feb. 10(1):12-25. [Medline]. Stevanovic M, Sharpe F. Management of established Volkmann's contracture of the forearm in children. Hand Clin. 2006 Feb. 22(1):99-111. [Medline]. Wilson PD. Capsulectomy for the relief of flexion contractures of the elbow following fracture. 1944. Clin Orthop Relat Res. 2000 Jan. (370):3-8. [Medline]. Sharma P, Swamy MK. Results of the Max Page muscle sliding operation for the treatment of Volkmann's ischemic contracture of the forearm. J Orthop Traumatol. 2012 Dec. 13 (4):189-96. [Medline]. Zuker RM, Bezuhly M, Manktelow RT. Selective fascicular coaptation of free functioning gracilis transfer for restoration of independent thumb and finger flexion following Volkmann ischemic contracture. J Reconstr Microsurg. 2011 Sep. 27(7):439-44. [Medline]. Tang H, Zhang SC, Tan ZY, Zhu HW, Zhang QL, Li M. Functional reconstruction of ischemic contracture in the lower limb. Chin J Traumatol. 2011 Apr 1. 14(2):96-9. [Medline]. Hashimoto K, Kuniyoshi K, Suzuki T, Hiwatari R, Matsuura Y, Takahashi K. Biomechanical Study of the Digital Flexor Tendon Sliding Lengthening Technique. J Hand Surg Am. 2015 Oct. 40 (10):1981-5. [Medline]. Fischer JP, Elliott RM, Kozin SH, Levin LS. Free function muscle transfers for upper extremity reconstruction: a review of indications, techniques, and outcomes. J Hand Surg Am. 2013 Dec. 38 (12):2485-90. [Medline]. Griffart A, Gauthier E, Vaiss L, Williams T, Mallard F, Le Nen D. Functional and socioprofessional outcome of surgery for Volkmann's contracture. Orthop Traumatol Surg Res. 2018 Nov 20. [Medline]. Fitzgerald AM, Gaston P, Wilson Y. Long-term sequelae of fasciotomy wounds. Br J Plast Surg. 2000 Dec. 53(8):690-3. [Medline]. Ultee J, Hovius SE. Functional results after treatment of Volkmann's ischemic contracture: a long-term followup study. Clin Orthop Relat Res. 2005 Feb. 42-9. [Medline].